Santa has come early at Burwell Museum and has given us 4 shiny sails for our windmill! The windmill sails are due to be fitted on Tuesday 10th December. Check our Facebook or Twitter pages for updates. Our millwrights have nearly finished the work on the windmill sails and now hope be be able to attach them to the mill sometime in the week commencing 8th December. The millwrights will need a couple of days to prepare the sails on site before they go on. Attaching the sails to the mill is a weather dependant operation - ideally a calm, dry day. Our millwrights will update us closer to the time and we will the pass on this information as soon as possible. Members of the public and media will be most welcome to watch the sails being attached. Residents of Saxon Drive, Mill Lane and Mill Close will receive a letter from us to inform them of the work. Before that, though, we are going to be on tv! A couple of weeks ago a production company working for the BBC came to do some filming at Stevens' Mill which included interviews with Paul, the Museum Trust Chairman, Jane, Fresh Wind in Our Sails Project Manager, and Luke, Mill Consultant. The last of the scaffolding surrounding the mill was removed today (6th November 2013) as the builders have now finished the painting of the exterior of the mill. This means that the site is now clear for our millwrights to install the 2 renovated and 2 new sails later this month (hopefully - weather permitting). Our volunteer "Shutter Team" have finished making and painting all the new shutters and these have been collected by the millwrights and fitted into the sails. The sails will remain at the millwrights yard in Lincolnshire until the installation day. Keep checking this Blog or our Facebook or Twitter pages for the date of the installation of the sails. 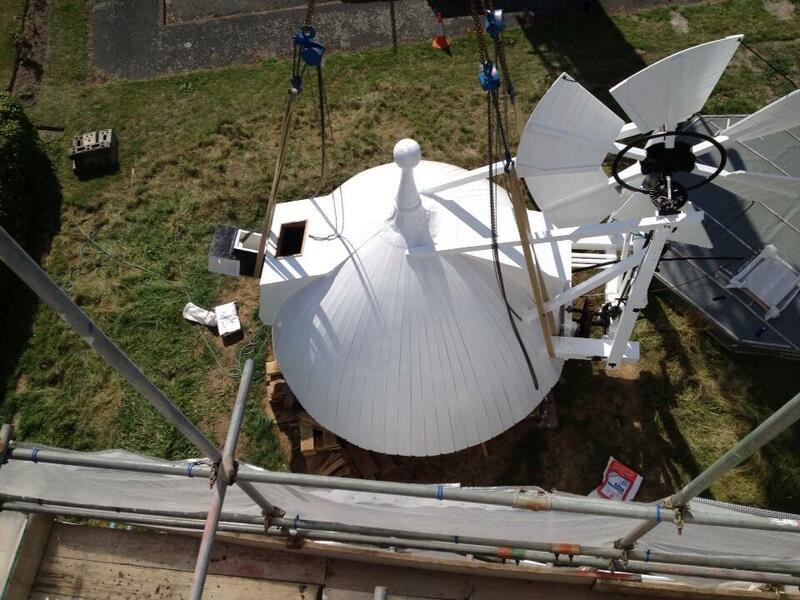 The cap of Stevens' Mill was lifted back on top of the mill tower on the morning of 29th August 2013. We are very grateful to our neighbours in Mill Close for putting up with the enormous crane being parked in their street for half a day. Special thanks to the neighbours who allowed people to stand on their drives and lawns to get a better view of the cap lift. Photos below. Video at very bottom of the page. Not an Anthony Gormley sculpture but one of the millwrights preparing to attach the crane to the mill's temporary roof. As seen from Saxon Drive. The temporary roof is removed. The millwrights prepare the cap to take the fantail. 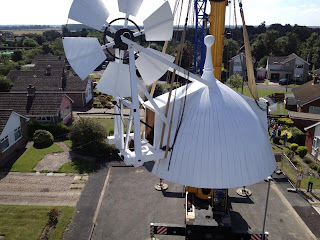 The fantail is lifted from the museum site. Fantail lowered in to place. 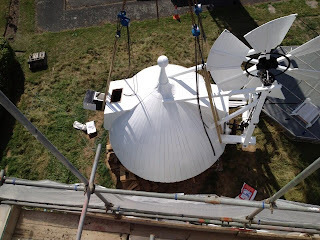 With the fantail attached the cap is prepared for lifting. Cap lifting. Photo by millwright Steven from the top of the mill tower. Another view from the top of the mill by Steven. You can see some local residents watching the lift. Guiding the cap into position as it's lowered. Millwright Neil lowers the cap the last few centimetres using the chain blocks. The chains and strops are now slack meaning the cap is in place. Safety rails for the fantail stage are attached to the crane. Safety rails lowered on to the scaffolding for Neil to put in place on the fantail stage. The mill site looking tidier and bigger with the safety fence removed and the grass cut. This where the cap sat from 13th March 2013 until 29th August 2013. The grass will grow back soon. This video is in HD. Click on the cog symbol once you have started the video to select picture quality. Click on the dashed square symbol to view full-screen.